The 99th Fighter Squadron was sent to North Africa in April 1943 for combat duty. They were joined by the 100th, 301st, and 302nd African-American fighter squadrons. Together these squadrons formed the 332nd fighter group. The transition from training to actual combat wasn't always smooth given the racial tensions of the time. However, the Airmen overcame the obstacles posed by segregation. Under the able command of Col. Benjamin O. Davis, Jr., the well-trained and highly motivated 332nd flew successful missions over Sicily, the Mediterranean, and North Africa. Bomber crews named the Tuskegee Airmen "Red-Tail Angels" after the red tail markings on their aircraft. Also known as "Black" or "Lonely Eagles," the German Luftwaffe called them "Black Bird Men." The Tuskegee Airmen flew in the Mediterranean theater of operations. The Airmen completed 15,000 sorties in approximately 1,500 missions, destroyed over 260 enemy aircraft, sank one enemy destroyer, and demolished numerous enemy installations. Several aviators died in combat. The Tuskegee Airmen were awarded numerous high honors, including Distinguished Flying Crosses, Legions of Merit, Silver Stars, Purple Hearts, the Croix de Guerre, and the Red Star of Yugoslavia. A Distinguished Unit Citation was awarded to the 332nd Fighter Group for "outstanding performance and extraordinary heroism" in 1945. The Tuskegee Airmen of the 477th Bombardment Group never saw action in WWII. However, they staged a peaceful, non-violent protest for equal rights at Freeman Field, Indiana, in April 1945. 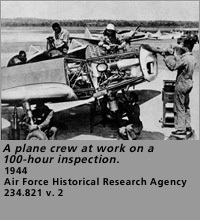 Their achievements proved conclusively that the Tuskegee Airmen were highly disciplined and capable fighters. They earned the respect of fellow bomber crews and of military leaders. Having fought America's enemies abroad, the Tuskegee Airmen returned to America to join the struggle to win equality at home.